Pleidiol Wyf I'm Gwlad, Welsh for "I am true to my country"
Within a circular riband vert fimbriated Or bearing the motto Pleidiol Wyf i'm Gwlad in letters the same and ensigned with a representation of the Crown proper, an escutcheon quarterly Or and gules four lions passant guardant counterchanged armed and langued azure, encircled by a wreath alternating of leek, thistle, clover, leek and rose. 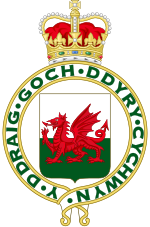 A Royal Badge for Wales was approved in May 2008. It is based on the arms borne by the thirteenth-century Welsh prince Llywelyn the Great (blazoned quarterly Or and gules, four lions passant guardant counterchanged), with the addition of St Edward's Crown atop a continuous scroll which, together with a wreath consisting of the plant emblems of the four countries of the United Kingdom, surrounds the shield. The motto which appears on the scroll, PLEIDIOL WYF I'M GWLAD ("I am true to my country"), is taken from the National Anthem of Wales and is also found on the Welsh designs for £1 coins minted from 1985 until 2000. The badge formerly appeared on the covers of Assembly Measures; since the 2011 referendum, it now appears on the cover of Acts passed by the National Assembly for Wales and its escutcheon, ribbon and motto are depicted on the Welsh Seal. The current badge follows in a long line of heraldic devices representing Wales. Its predecessors have all been variations on either the Red Dragon, an ancient emblem revived by Henry VII, or the arms of Llywelyn. 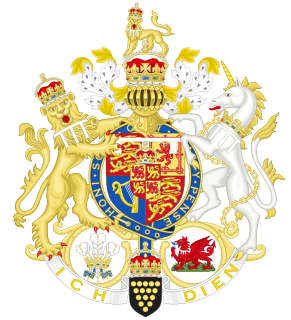 Whereas the arms of England, Scotland and Ireland are represented in the Royal Arms of the United Kingdom, Wales has no such representation due to it having been annexed and incorporated into the Kingdom of England; therefore Wales had no status as a nation within the Kingdom of England, and the succeeding United Kingdom. The device introduced in 2008 is accordingly a heraldic badge, rather than a coat of arms; Wales currently has no official coat of arms. Before the Norman Conquest, Wales was ruled by a number of kings and princes, whose dominions shifted and sometimes merged following the vagaries of war, marriage and inheritance. All these kings and princes were ascribed personal coats of arms, often retrospectively if they lived before the dawn of heraldry as it is currently known, and these were borne by their descendants in Wales. The two principal Welsh kingdoms were those of Gwynedd, in the north, and Deheubarth in the south. 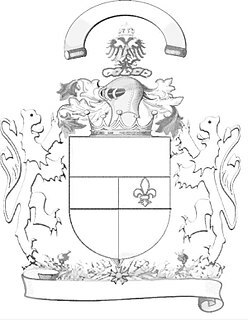 Of these, the more successful, and the last, finally, to fall, was that of Gwynedd, and the arms now borne by the Princes of Wales as an inescutcheon since 1910 are the historic arms of the dynasty of Gwynedd as borne by the last native Princes of Wales, including Llywelyn the Great and Llywelyn ap Gruffudd. These arms have the blazon Quarterly Or and Gules, four lions passant guardant counterchanged, armed and langued Azur. Odious design expressing nothg. but spite, malice, ill-will and monstrosity. Words (Red Dragon takes the lead) are untrue and unduly flattering to Bevan. Wd. rather be on R[oyal] Arms. This (dating from Henry VII) will be somethg. We get no recognition in Union – badge or flags. In 1956 this badge was added to the arms of the Welsh capital city Cardiff by placing it on collars around the necks of the two supporters of the shield. The badge was the basis of a flag of Wales in which it was placed on a background divided horizontally with the top half white and bottom half green. In 1959 Government use of this flag was dropped in favour of the current flag at the urging of the Gorsedd of Bards. The badge was used by the Welsh Office and its successor the Wales Office until January 2017. It was used in the interim logo of the National Assembly for Wales until the "dynamic dragon" logo was adopted. The escutcheon granted to The Princes of Wales since 1911. The heraldic banner of The Prince of Wales introduced in 1960, for use in Wales. 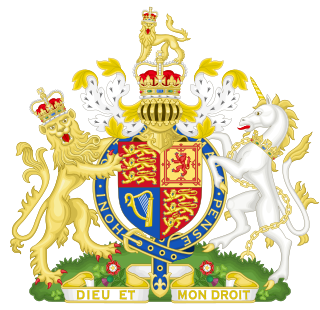 When in 1911 the future King Edward VIII was made Prince of Wales, a warrant exemplifying his arms was issued. Along with the usual royal arms differenced by a "label" of three points, his main coat of arms included an "inescutcheon surtout" crowned with the heir apparent's coronet and containing the arms of Llywelyn of Gwynedd to represent the principality of Wales. It is unclear whether, before this date, they were thought of as the "arms of Wales" or simply as the "arms of Llywelyn". But they had certainly not previously been used by heirs to the English or British thrones; indeed, in his 1909 book A Complete Guide to Heraldry, Arthur Charles Fox-Davies had written: "It is much to be regretted that the arms of HRH The Prince of Wales do not include...any allusion to his dignities of Prince of Wales or Earl of Chester. "[page needed] The only allusion, before this innovation, to Wales in the royal arms had been the inclusion, among many other badges, of on a mount vert a dragon rouge – the royal badge on which the present flag of Wales is based. In the 1960s, A banner of the principality's arms, defaced with an inescutcheon of his heraldic coronet, was introduced for the Prince of Wales's use in Wales. In 2007 the Presiding Officer of the National Assembly for Wales entered into discussions with the Prince of Wales and the College of Arms regarding a grant of arms for official use by the assembly. A new royal badge designed by the Garter King of Arms, Peter Gwynne-Jones, was granted in 2008 based on the arms of Llywelyn. ^ "First Welsh law's royal approval". BBC. 9 July 2008. Retrieved 6 March 2016. ^ "Example of badge use on Welsh measure" (PDF). Retrieved 6 March 2016. ^ "Example of badge used on the first Welsh act" (PDF). Retrieved 16 January 2017. ^ "No. 39798". The London Gazette. 13 March 1953. p. 1437. ^ Flags of the World, "Wales"
^ Barraclough, EMC. Flags of the World, 1965. ^ "No. 27385". The London Gazette. 10 December 1901. p. 8714. ^ "No. 28473". The London Gazette. 7 March 1911. p. 1939. ^ Betsan Powys. "Leeks and all". BBC. Retrieved 6 March 2016. 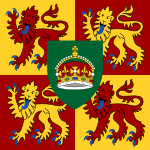 The coat of arms of Saskatchewan is the heraldic symbol representing the Canadian province of Saskatchewan. 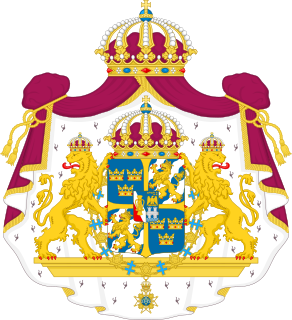 The coat of arms of the Kingdom of Sweden has a lesser and a greater version. 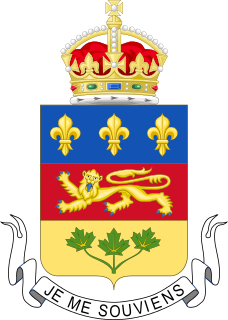 The coat of arms of Quebec was adopted by order-in-council of the Government of Quebec on 9 December 1939, replacing the arms assigned by royal warrant of Queen Victoria on 26 May 1868. The coat of arms of the Extremadura is described in the Title I of the Spanish Law 4 of June 3, 1985, the Law of the coat of arms, flag and regional day of Extremadura. In heraldry, a pile is a charge usually counted as one of the ordinaries. It consists of a wedge emerging from the upper edge of the shield and converging to a point near the base. If it touches the base, it is blazoned throughout. The first instance of a figure of the lion as symbol of the Kingdom of León is found in minted coins of Alfonso VII, called the Emperor (1126-1157). 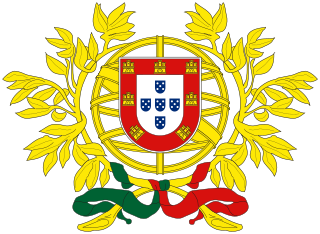 Until then, the cross had a preponderant position on documents and coins of Leonese monarchs since that reign the cross was gradually displaced by the lion. 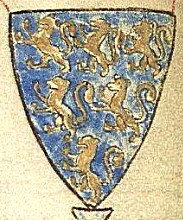 The Spanish historian and heraldist Martín de Riquer explained that the lion was already used as heraldic emblem in 1148. At the end of the reign of Alfonso VII, the figure of this animal began to appear on royal documents as personal device of the monarch and became pervasive during reigns of Ferdinand II (1157-1188) and Alfonso IX (1188-1230).